From birth to age 6, children possess an almost genius-like capacity to absorb information and they have a natural enthusiasm for learning. 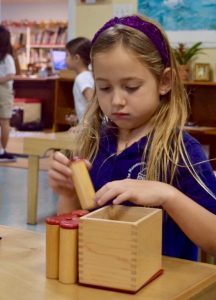 Guided by the Montessori philosophy, our curriculum nurtures the student's innate desire to learn and experience the world around them. 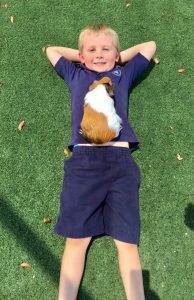 Our prepared environment allows children freedom within limits and a unique opportunity to reflect upon their own achievements. 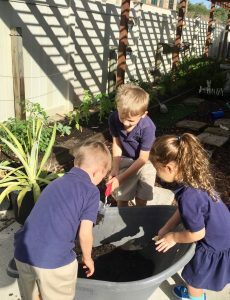 In this setting, the child seeks physical and mental activities to better know and understand themselves and their environment while challenging themselves to acquire new skills and abilities. These exercises promote independence, self-knowledge, and confidence. 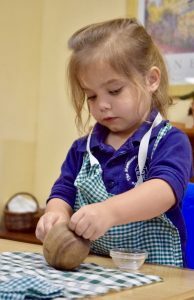 Children in our Primary Class focus on developing skills in five principle areas: Practical Life, Sensorial, Language, Math and Culture. The cornerstone of Practical Life is meaningful activity. The Practical Life exercises are simple and ordinary activities, such as pouring water, opening containers, and folding cloths. 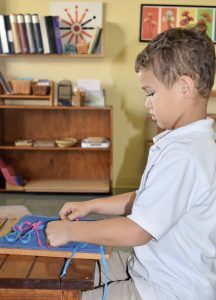 Performing these activities evokes a sense of order and helps develop control of movement and dexterity, sequencing and concentration through inviting and purposeful work. The child's self confidence increases as they gain independence and learn to care for themselves. 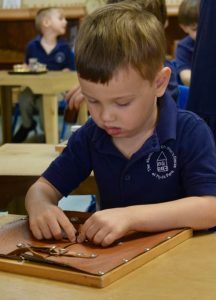 The Montessori philosophy emphasizes learning through all five senses, not just through listening, watching, or reading. 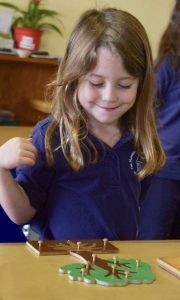 Students in a Montessori classroom learn by "doing", engaging in multi-sensory exploration, deepening the learning experience. 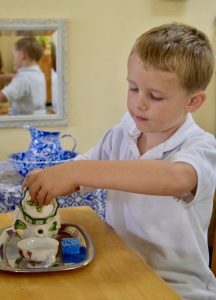 Sensorial activities let the child refine their senses as they explore relationships of the physical world. Each material used for these exercises isolates a particular sensory input or experience - sound, touch, vision, taste and smell. 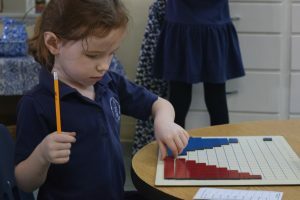 As children perform this work, they learn to order, classify and compare impressions. For example, the difference between quiet, louder, loudest, or small, larger, largest. 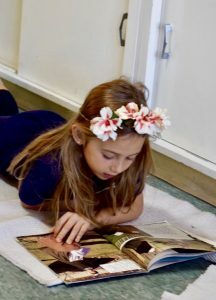 Language provides the child with tools for socializing and gives the child a foundation for understanding the cultural heritage of literature, history, and an appreciation of the natural order of the world around them. Work in this area includes oral language development, written expression, reading, and elements of grammar and literature. Rhymes, sound games, songs and vocabulary related to all areas of study (for example, geography, history, and botany) are introduced very early. 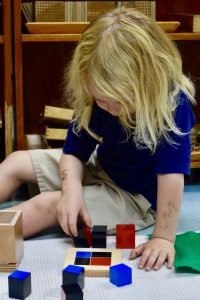 Our language rich environment is full of objects, such as sandpaper letters, movable alphabets and language cards to guide children at every developmental level. 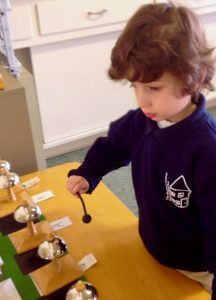 All the lessons in this classroom, are taught with very specific vocabulary, naming each object and action in the lesson. Thus, all lessons become language lessons. 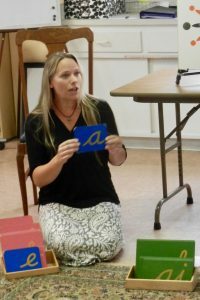 Moveable alphabets are an important tool used to guide children in both writing and reading. First, the child learns the sounds associated with each letter. 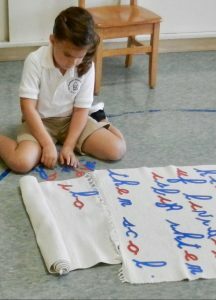 Later, using the moveable alphabet, they begin to "write" words and phrases built with the learned phonetic sounds. Practice with this moveable alphabet teaches the child to read phonetic words. 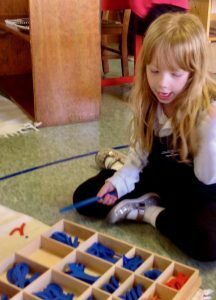 As this work continues, the student will spontaneously synthesize all of the phonemes they have learned and the sight words they have been given and discover they can read. 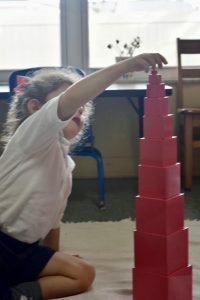 At the Primary level, the prior sensorial activities where many fundamental concepts, such as length, volume, gradation, sequencing, and grouping have been already experienced via the senses, serves as the foundation for the child's understanding mathematics. 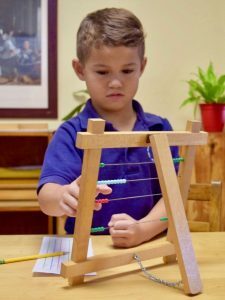 Our math exercises use manipulative materials to help the child gain an understanding of the concept of numbers, symbols, sequencing and operation. 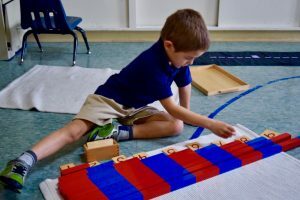 This concrete representation of mathematical concepts allows the child to gradually internalize these ideas without confusion or anxiety. 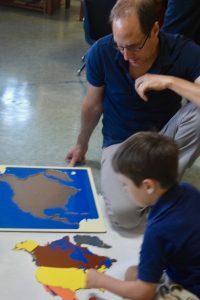 Cultural activities reflect upon our human understanding of geography, history, science, arts and foreign language. In order to give each of our young students a broad exposure to these topics, we bring the world to them. Our environments are rich with animal life, plant life, and cultural studies.